Empower your teams to adeptly manage the floods of data that inundate your organization and gain deeper insights by introducing them to the Modern Analytics Lifecycle. 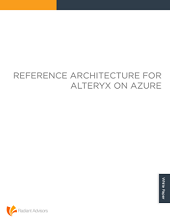 Alteryx, when coupled with the leading cloud provider Microsoft Azure, can transform companies from status-quo to data-driven organizations that empower their business analysts and data scientists to push previously untouched boundaries. When harnessed with the likes of Microsoft Azure, Alteryx yields faster results and the bandwidth required for smooth rafting even on the choppiest of water.